We are excited to announce that our inaugural cruise will he attended by both Norman Reedus and Chris Hemsworth! 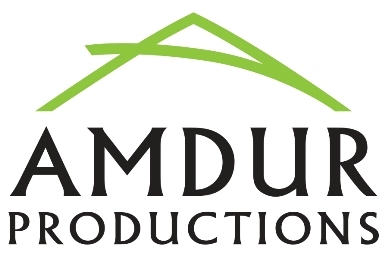 Other announced guests include Ernie Hudson, Barry Bostwick, Joel Hodgson & Sara Underwood. Many more celebrity guests, artists and cosplayers will be announced soon.
. All guests will need a cruise account to book. Full details and pricing will be posted soon to www.wizardworldcruise.com. Info is also available on WizardWorld.com. The W. Eugene Smith Fund announces it is now accepting applications for its 37th annual Grant in Humanistic Photography. Since presenting its first grant in 1980, the Fund has awarded more than one million dollars to photographers whose works, in the tradition of Eugene Smith, have been exemplary. Photographers interested in learning more about the $30,000 grant and in submitting an application should visit SmithFund.org. Applications will be accepted through May 31, 2016. The grant is presented annually by The W. Eugene Smith Memorial Fund to photographers whose work is judged by a panel of experts to be in the best tradition of the compassionate dedication exhibited by W. Eugene Smith during his 45-year career in photojournalism. The grant, which honors the legendary photo-essayist, enables recipients to undertake and complete worthy photojournalistic and documentary projects. The recipient of the 2016 Smith Award will receive a $30,000 grant to complete a current or future documentary project. In addition, one or more Fellowships totaling $5,000 will be given to photographers. appoints a three-member international jury that meets twice during the adjudication process. Finalists are selected on the merit of the substantive, photographic, and intellectual merits of their project. They are then asked to submit a comprehensive print or electronic portfolio, and write, if necessary, a more detailed and focused proposal or answer questions by the jury regarding their project. The Grant and Fellowship recipients are chosen on the basis on these submissions. for the annual Howard Chapnick Grant as of June 1st through July 15th, 2016. The grant is presented to an individual for his or her leadership in any field ancillary to photojournalism, such as picture editing, research, education and management. It was established in 1996 to honor the memory of Howard Chapnick who led the Black Star photo agency, and to acknowledge his enormous contribution to photography. The annual $5,000 grant may be used by the recipient to finance a range of qualified undertakings, which might include a program of further education, special research, a long-term sabbatical project, or an internship to work with a noteworthy group or individual. This grant is not for the creation or production of photographs. The W. Eugene Smith Memorial Fund is supported by generous contributions from The Incite Project, Canon USA and Swann Auction Galleries. Additional support is provided by Photo District News, International Center of Photography (ICP), School of Visual Arts (SVA) BFA Photography, MFA Photography, Video and Related Media departments, Media Storm, Synergy Communications, and Aperture. 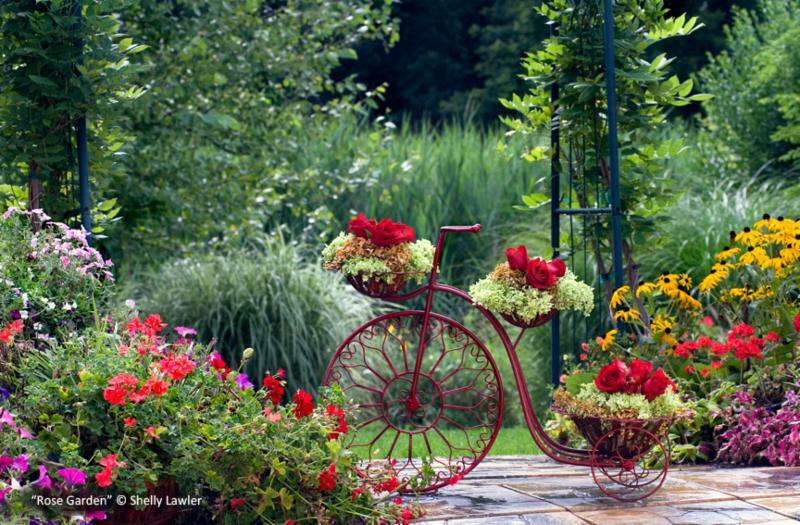 April showers bring May flowers (although they are still snow showers here in Chicago)! 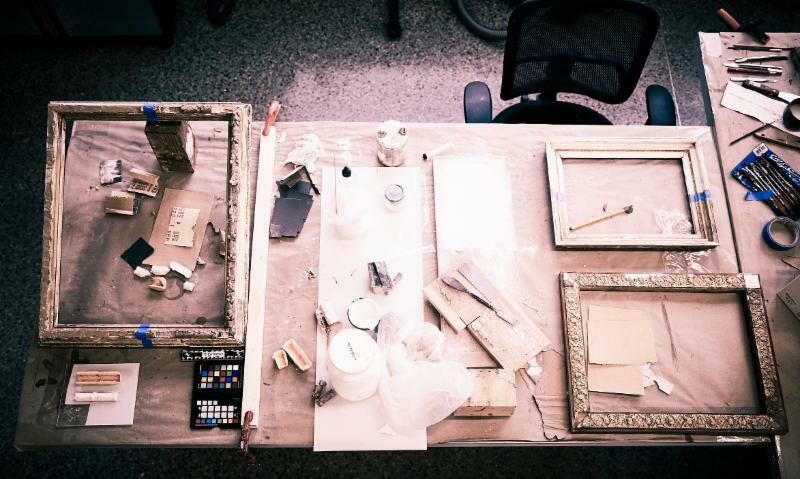 This month we take a look into the conservation of an original pulp magazine cover painting and its creative framing solution. 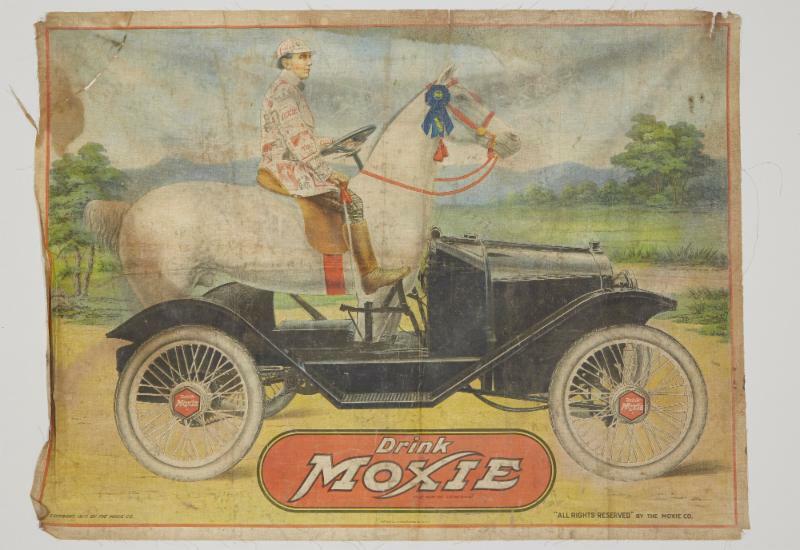 Our second story highlights four rare advertising banners that beat the odds of an ephemeral life to last almost a century! Finally, be sure to check out our newest photo compilation "Conservation Station" to see our team in action. Happy reading! 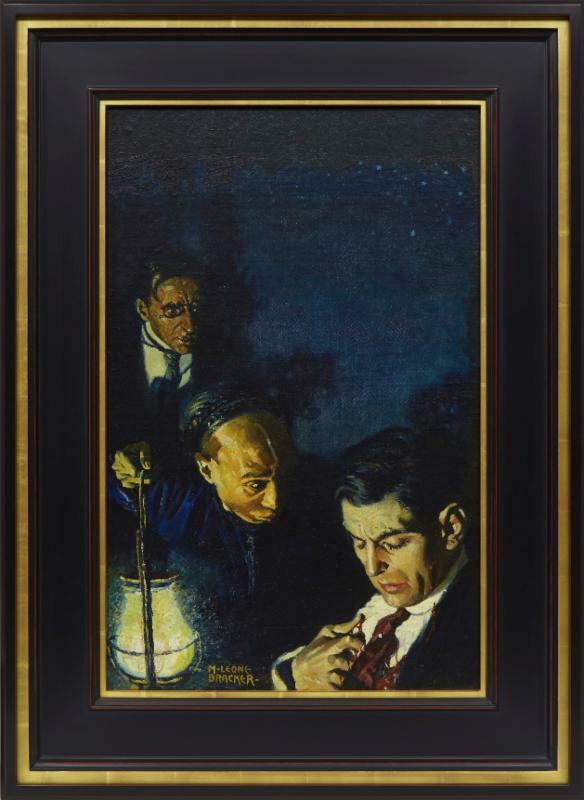 Adventure, which was published in 1910.The owner of this unusual painting started reading pulp magazines almost 40 years ago, and his budding interest quickly grew into a collection of pulp magazines and eventually, the original cover art as well. "I always enjoyed the cover art, and in the early 1990's had an opportunity to buy my first two pulp paintings... from that point on, I was hooked on collecting original pulp art." Pulp magazines reached the pinnacle of their popularity during the early 20th century. Much like newspapers, advertising materials have a definite and distinct shelf-life. Products come and go, and for those companies that do stick around for many years, marketing slogans and styles will change with the times, thus deeming periodic updates to advertising campaigns a necessity. As a result, vintage advertising materials were not made to last for very long: they were constructed with low cost materials and quick reproduction methods that make their survival a rarity. That's why it is so astounding when items like these banners make it decades remarkably intact. Here's a look at four advertising banners that have come through the doors at The Center over the years. Check out Conservation Station: A Behind the Scenes Look at The Conservation Center. Click here to see the compilation of our team hard at work! The May Art Market May 6-7, 2016 takes place at the Daley Center, 50 W Washington St, Chicago, IL on the Friday and Saturday from 8am-6pm before Mother's Day. If you are looking for last minute Mother's Day gifts, this is the art market for you! Find mom the perfect pair of earrings, a beautiful necklace, a painting that you know mom would love, or a sculpture to add to moms collection. This Friday and Saturday show is set in Chicago's famous Daley Plaza in the "Loop", the heart of downtown Chicago. More than 500,000 people live in, work in, and visit this dense area every day. Standing 50 ft. tall, the Chicago "Picasso" located in Daley Plaza is one of the most famous sculptures in Chicago. This show is free admission. 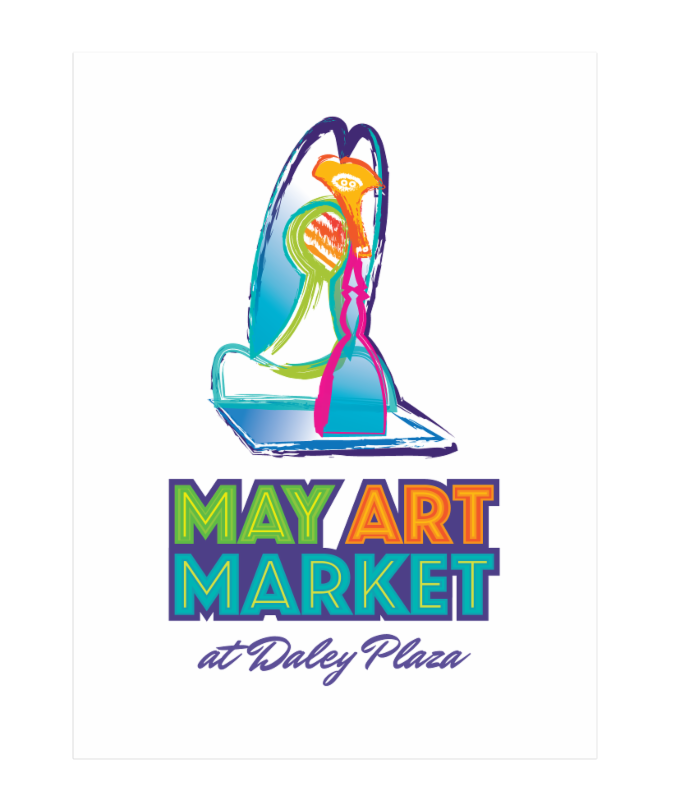 "We are pleased to have the May Art Market in Daley Plaza. The Art Market is an example of a wonderful new amenities that serves the needs of our large employment base but also acknowledge that over 15,000 people live in the Loop." says, Michael Edwards, President & CEO, Chicago Loop Alliance. Children can also enjoy the youth art tent where they will be able to make clay masterpieces to take home. Enjoy free souvenir photos to take home with you as well! Barnebys, the world's largest search engine for fine art and antiques auctions, launches in China this week. Barnebys arrival in China means that Western buyers will now be able to access Chinese auction house catalogues when searching for an object and conversely millions of Chinese buyers will be able to access Western auction house catalogues to search for treasured items. The Barnebys mechanism means that you don’t have to trawl through hundreds of auction house catalogues, you simply enter what you are looking for and the Barnebys search engine will give you a list of who is selling such items, where and for how much. As the world increasingly becomes one big marketplace, Barnebys, the leading search service for fine art and antiques, is taking the first step into opening up the Asian market to the world’s buyers and sellers. Barnebys Hong Kong launch includes a website in Chinese, as well as dedicated newsletters, a Facebook page, Twitter and Weibo. 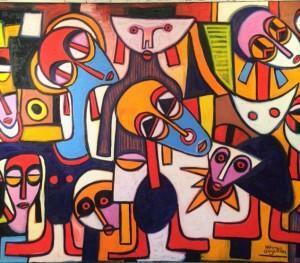 Globally the company offers buyers and sellers access to some 1,500 auction houses and 500 art dealers. The mission of the launch in Hong Kong is to reach an ever more diverse market. In the past five years, Chinese collectors have grown in their buying and presence at European auctions. The Barnebys Hong Kong launch serves this ever growing market demand from the Chinese market to be able to reach European sellers, and vice versa, for these sellers to reach out to a huge potential of Eastern clientele. *Figures according to Artprice market report for 2015.
and one of the foremost experts on the Antikythera Mechanism. 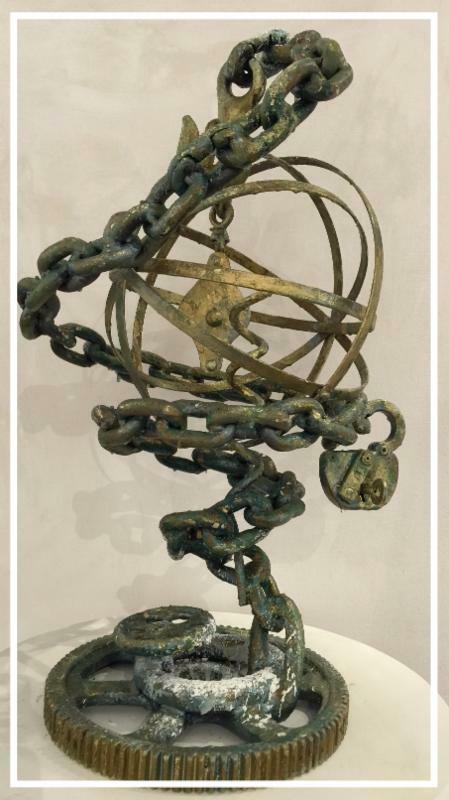 Dr. Seiradakis will discuss the analog computer from 205 BC that was designed to predict astronomical positions, accompanied by the sculptures of TERRY POULOS. More than 2000 years ago, Greek scientists created the world's first computer. 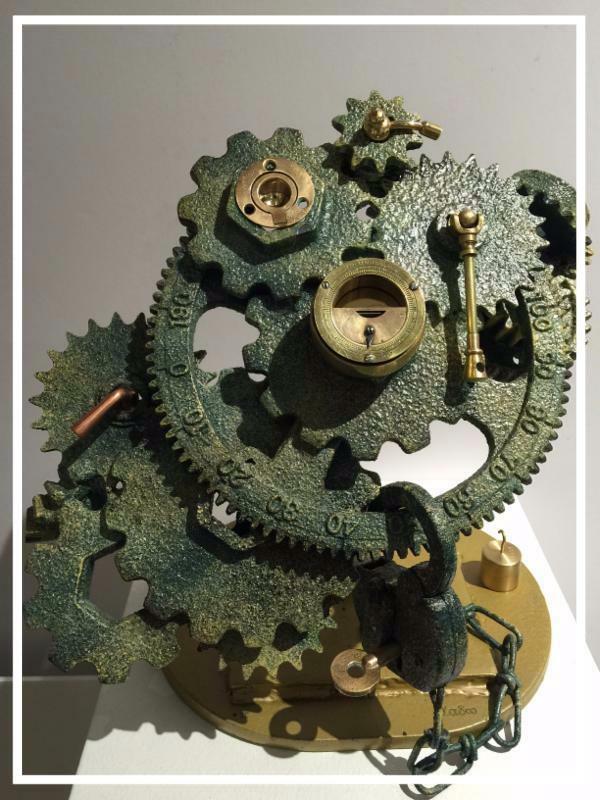 sun, the moon, and most of the planets, now known as the Antikythera Mechanism, is the world's first computer. Found by Greek sponge divers in an ancient shipwreck, its corroded remnants give us fresh insights into history and challenge our assumptions about technology transfer over the ages. Dr. John Seiradakis, Radio Astronomer and Physics Professor will discuss the work of an international team of experts who used 21st century technology to decode the truth behind the world's first computer. 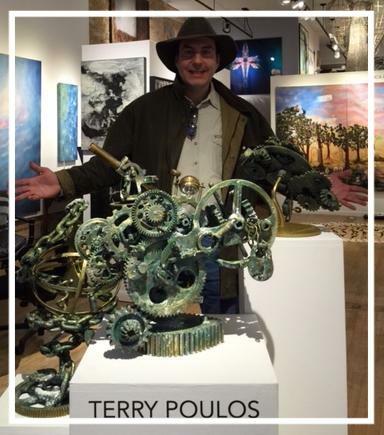 The discussion will be accompanied by the sculptures of our own "Indiana Jones" Terry Poulos, who created the "Arti-kythera ~ Homage to the World's First Computer" and the "Archimedes Vortex."